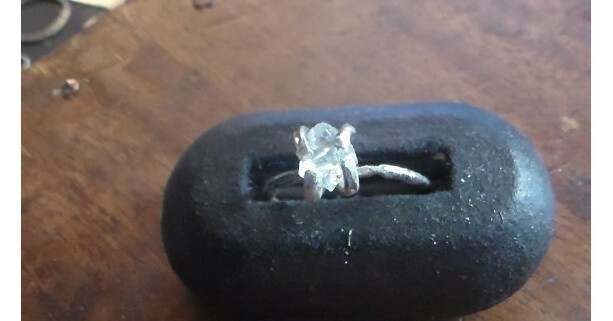 A Rough Raw Natural California Diamond is Prong Set on a Sterling silver notched band, just for you here in my Studio. Hand buffed and tumbled for added strength and shine. Ring in the photo is a size 6. 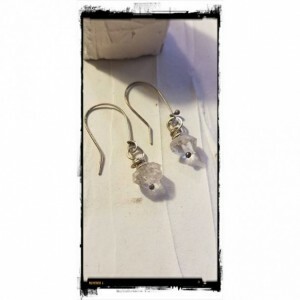 *This Item is one of a kind* Ships Priority with delivery confirmation, arrives gift boxed! Size 6 Band:1mm. width diamond: 7mm. x 5mm /1/2 carat Rough, raw California Diamonds.The diamond is @ 1/2 carat . California has been the scene of incredible volcanic activity throughout its ancient past. Mount Konocti, the area's defining landmark, is a dormant volcano where past lava flows of magma and basalt were contained under enormous pressure with temperatures of not less than 1,112 Fahrenheit. Heat and pressure resulted in the formation of beta silicon dioxide crystals - California Diamonds - of unsurpassed clarity and the finest optical quality. In the late 1920's California diamonds were mined commercially and Tiffany used them for a while, they are clear, rarely colored and very hard, ranking from 7.5 to 8 (and possibly as high as 9) on the Mohs Scale, and like all diamonds, they can cut glass. They have been used commercially and industrially. 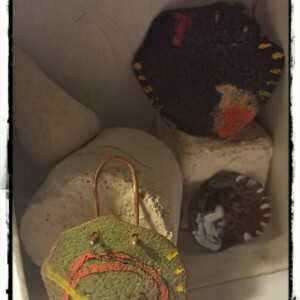 These semi-precious gems may be set uncut for a rough natural look, or faced to set off their inner fire which compares in brilliance to African carbon diamonds. Diamonds have the longest endurance of any substance known to man. Carbon dating has established that diamonds, on average, are 3.4 billion years of age. California diamonds were formed between 100,000 and 600,000 years ago. The word “diamond” comes from the Greek word adamas, meaning “unconquerable and indestructible.” Diamonds were worn in ancient times to promote strength, invincibility and courage. Diamond is also the gemstone of love: when carried or worn. Diamond is said to advance positive relations, conquer infertility and ensure fidelity.